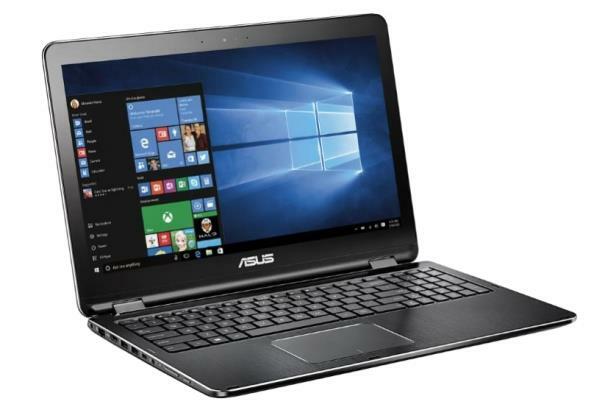 The Asus Q553UB is a 2-in-1 15.6-inch touch-screen laptop PC with the popular band-back convertible design. The Q553UB-BSI7T13 is a higher-end model with the fast Intel Core i7 processor, a dedicated video card, 12GB of system memory, a huge 2TB hard drive, and a DVD drive, all encased in a black brushed aluminum chassis. Furthermore, the 5.1-pound notebook is equipped with Full HD display resolution, IPS wide viewing angle technology, and keyboard backlight, rounding off the premium-class features. Another appealing aspect of the Asus Q553UB-BSI7T13 is port selection, since it provides the latest USB-C connector, besides two standard USB 3.0 ports and a USB 2.0 port. Furthermore, the 2-in-1 convertible sports HDMI video output, a combo audio port, and a multi-format media card reader. For sound, there are stereo speakers, while video conferencing is available via a 1-megapixel web camera. Internet connectivity is enabled via 802.11AC wireless or Ethernet LAN. The system also includes a Bluetooth interface. The following software and drivers are compatible with your ASUS Q553UB and Microsoft Windows 10 64-bit.